Here is a fun at home craft you and your kids can do together. 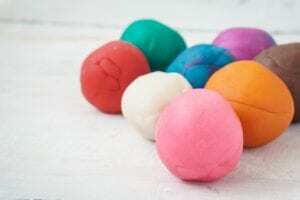 Make your own homemade gluten free playdough. It is very simple to make, and it brings hours of fun. Pour the salt and the corn starch into a pan. If you are using food coloring and/or essential oil, mix a few drops into the cold water. Add the cold water to the corn starch and salt, and mix well. Heat the mixture over medium heat, stirring constantly. The mixture will thicken, starting at the bottom of the pan. Scrape the pan as you stir. When the play dough becomes very thick, take it off the heat and turn it onto the table or counter. Allow it to cool until you can handle it, then have your child knead the warm play dough until it’s smooth and pliable.